Did you have any prior development or coding experience? I have basic experience with HTML, PHP and Python. However, my core competence is software development, project management and go-to-market strategy. What was the most challenging aspect of developing mobile app? The mobile app is an extension of the web platform CoinMarketAlert.com. The biggest challenge was deciding which functionality and features are necessary within the app while keeping the same user experience as the web platform. 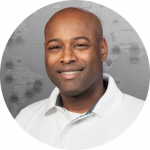 Roderick Warren is the founder of CoinMarketAlert.com, a leading platform for cryptocurrency price alerts and notifications currently helping over 18,000 crypto investors to protect their investments. Involved within the cryptocurrency and blockchain space since 2011, Roderick is a Certified Bitcoin Professional (CBT), crypto miner and also a consultant for businesses which are looking to integrate the blockchain technology. Previously, Roderick co-founded StartupBlink.com - a global startup ecosystem data platform, and has held engineering positions in various technology companies such as 'Sun Microsystems' and 'Oracle, Inc'. Before entering the Information Technology field, Roderick was a professional firefighter, and is also a U.S. Air Force Veteran. Name a few of your favorite apps and reason you love them. 'Trello', because it helps me keep our product roadmap and development sprints in order. If I have an idea, it’s easy to quickly record the information within the app. 'Telegram' is my favorite because it allows me to always stay in direct contact with the users of 'CoinMarketAlert'. The result of this direct communication is that we only build what our users request and don’t waste time building features which are not in demand. How long have you been working on this app? 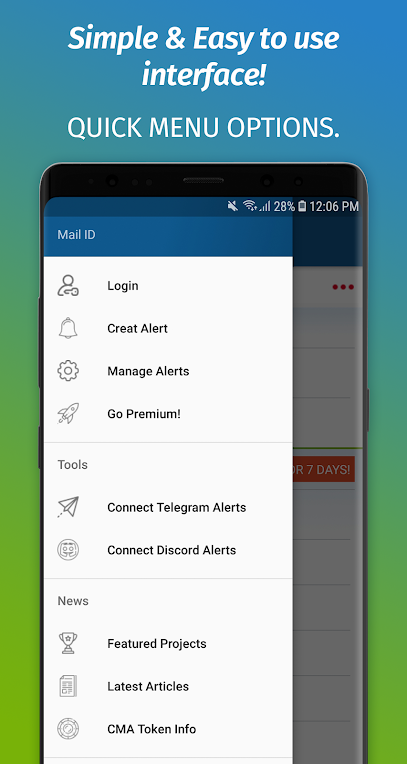 Working on this app was a challenging task and to ensure that it performs as expected, it took two months of planning and three months to fully develop the app. Additionally, after release, it took us a few more weeks to make modifications to meet the 'Play Store' policies. What need of the user did you have in mind when developing this app? Our mission is to help both new and experienced cryptocurrency investors and traders protect their investments by providing the best price alert tools possible. 'CoinMarketAlert' was initially created as a personal tool to track my investments with cryptocurrency. Shortly after going live, other users organically discovered the app, began using the service and requesting additional features and over time we have continuously worked on it to incorporate additional features that will be helpful to our customers. In what way do you think your app is better than similar apps on the market? Please describe in detail what innovation you think you bring and what you are proud of in your app. Before 'CoinMarketAlert', there were very few easy to use and inexpensive ways for a crypto investor to receive price alerts. Our app provides more advanced price alert tools and notification options than most similar services. Additionally, users have a portfolio manager and also receive CMA (ERC20) tokens when utilizing the service. The CMA tokens can then be used to pay for account upgrades or traded on popular crypto exchange for other cryptocurrency. By including the use of blockchain technology within our app, we can offer a more efficient and less expensive service. What are your future plans and expected features of the coming new versions of this app? In line with our mission, we will develop the best price alert tool possible. Recently, we have just released two new price alert tools (Recent High and Low Alert and Trailing Stop Alerts), and we have many more features in development. For example, in near future versions, users will also see additional notification options for 'Twitter', 'Facebook', 'WhatsApp' and more. More data points and features based on AI and direct exchange integrations are hot items in the product backlog. Assuming new users of your app are reading this page. What do you want to ask them to do (contact you about X, Share the app, etc.)? 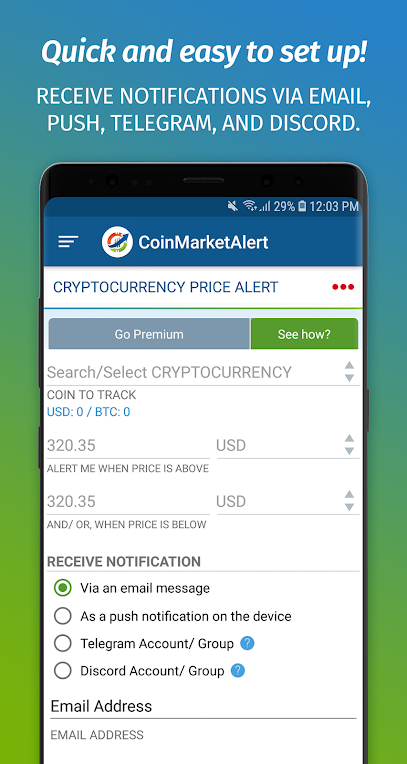 Download the app and use our price alert tools to help you protect your cryptocurrency investments. We will also be grateful if you share the app and/or give us a good rating. 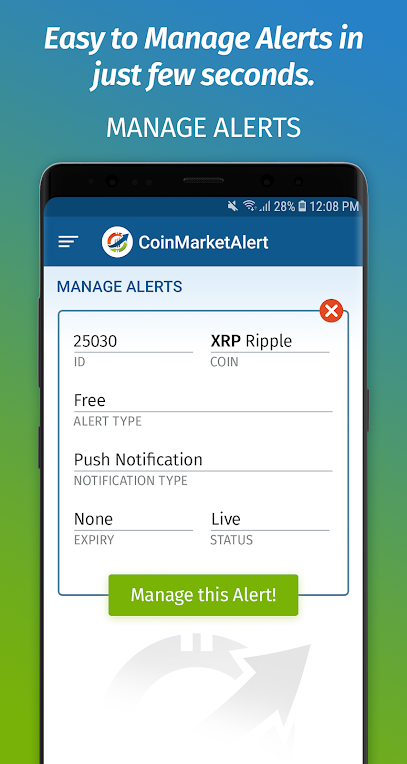 About App: The CoinMarketAlert app provides cryptocurrency price alerts via emails, push notifications, Telegram and Discord to connected devices dependent on parameters set by the user. It comes out of the box with various levels and types of alerts. Get notified on changes on the value of your portfolio. CoinMarkertAlert currently helps over 17,000 customers protect their cryptocurrency investments. • Cryptocurrency Price Alert: get notified when your selected coin price goes above or below your selected price. • Profit/Loss Alert: keeps you informed on whether you're making a profit or loss on your selected coin. • New Coin Alert: keeps you informed when there is a new coin released on the market. • Total Crypto Market Cap Alert: notifies you on the total cryptocurrency market cap based on your defined time frame. 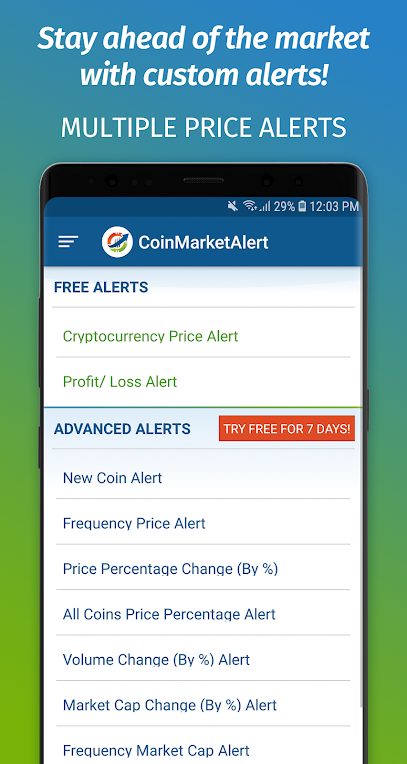 • Frequency Price Alert: notifies you on the price of a specific coin at your specific time frame. Every day we publish one great app and help 750,000 users discover new apps to add to their mobile device. Click here to add your app and let users discover it for free.